Spooky spider webs, black flowers, creepy creatures, ghostly ghouls … Yep, it’s time to get your “scare” on and get in the Halloween spirit! If you are among the many planning Halloween parties – whether you organize an elaborate Halloween horror show – (popular among serious celebrants) or arrange a relaxed gathering with lighthearted Halloween crafts or ghoulish Halloween party games – you can affordably create an ethereal theme. You may have seen a holiday flower arrangement for sale with a candy corn-filled vase and matching mix of orange and yellow blossoms. If you’ve got the budget, call your florist and order one for your party. You’ll free up time to focus on other tasks and ensure you get a professionally designed focal point for your festivities. If cash is limited, create one of the Halloween flower arrangements yourself. To duplicate the look, use a clear-glass container already hiding in your cupboard. Place a smaller container of about equal height inside your larger clear-glass vase. (The smaller container need not be clear but must be waterproof.) Fill the inside vase with fresh water and flower preservative. Carefully pour candy corn between the two containers to fill the space. 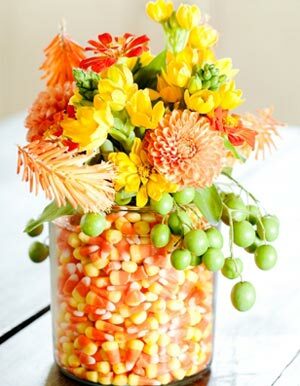 Add orange, yellow and white flowers – the colors of the ubiquitous candy corn. Want to follow the reduce-reuse-recycle theme this Halloween? Have some time to get extra creative? Create some funky flower vases using old soda, beer or wine bottles. Simply paint the exteriors with white, yellow and orange spray paint to duplicate the stacked colors in a candy corn piece. Then fill each vase with a single stem of red gerbera, yellow dahlia, orange aster or another favorite flower. Line them up along a windowsill or ledge, stack them on a stairway or set them together for a centerpiece. If you prefer something longer lasting, choose from the variety of manmade pumpkin baskets available and consider using mums instead of fresh flowers. For a more high-style look, Stewart pares out the interior of a white pumpkin, fills it with white dahlias and places it on a white cake stand. Halloween ooh-la-la! Here are a few more great Halloween flower arrangement ideas. #4 Halloween Party Food? Not! These Posies Are Poisonous! Want to continue the recycling theme? 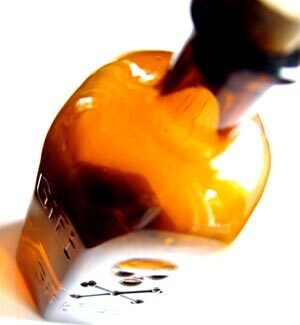 Create an apothecary of lethal liquids. Then group the bottles for a focal point or line them up to show off each caustic caution. Black flowers don’t exist in the natural world, but that doesn’t mean you can’t find them. And it doesn’t mean you have to turn to artificial flowers. Instead, use dye or spray paint to create a look that Mother Nature can’t. 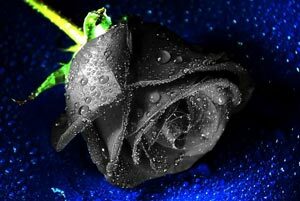 Dye: Esprit Growers in California has created “Twilight” black roses. These dyed-black beauties offer an unearthly look that is pure gothic glamour. Call your florist to order some. Or create your own Black Flowers (choose a light-colored flower, such as white carnations or hydrangeas; add dye or ink to the water; cut stems at an angle and insert into the water; let stand and allow the stems to uptake the color to the flower head). For more specific instructions, read this article: 3 Easy Techniques to Create Black Flowers. Accessorizing your bouquets is another option for enhancing your haunted-holiday tabletops. Stretch faux cobwebs over a bouquet of red roses; choose a black urn or vase for an air of macabre. Or sprinkle plastic spiders across the top of a bouquet of cream-colored roses for stark drama. Allow rubber snakes to slither among blossoms of orange and crimson chrysanthemums. Kids love to help decorate, so give them the task of making some cute creatures that they can insert into your Halloween bouquets. Gather up a supply of pipe cleaners, wiggly eyes, paint and glue. Then, show the kids how to construct the Halloween crafts. Curl the pipe cleaner bodies or bases around wooden picks or straws and nestle the mini monsters into your flower arrangements. Want some more Halloween crafts for the kids? Show them how to make gruesome monster hands. Whip up some green gelatin and spoon it into latex surgical gloves. Tie the wrists closed, paint on black fingernails with black marker and let kids place the plastic appendages into flower planters and other containers in your home. If you want to create a more low-key but ultra-stylish look for your Halloween get-together, add subtle touches of black and orange to your tablescapes. Wrap low, white ceramic vases with wide black ribbon and layer a white, slightly narrower ribbon on top. Add a thinner ribbon in orange on top of the white. Fill the containers with orange roses in low, rounded masses. Placemats and other accessories that pick up hints of orange and black complete the look. Once you’ve decided on your Halloween decorations, you have one more chore, of course: Considering all your Halloween costume ideas. You could follow the crowds and choose a trendy Snooki or Lady Gaga Halloween costume. Or you could save that money (for more flowers!) and join the frugalistas with a sense of humor. You know the ones; they never buy costumes. Instead, they create their own cleverly funny Halloween costumes (like the guy in regular clothes with the sign that says, “Nudist on strike”). 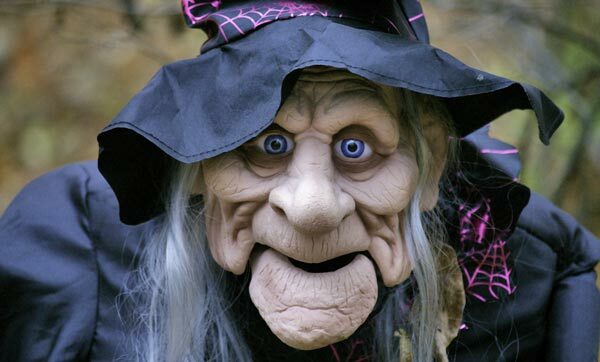 Then again, I can probably scare my guests silly simply by not wearing any makeup and adding a witch’s hat. Hmm… I think that could be among my best Halloween costumes yet! Broooo ha ha! Thanks Gina, I just love your Halloween ideas! I really want to use some of those black roses to decorate with. Can you imagine a mix of those with some orange dahlias or asters? Very cool! I agree! I think they add some real glam! Wow! What terrific Halloween ideas! 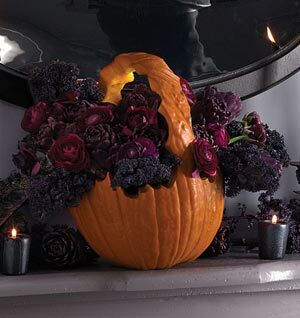 If you like these ideas, you’ll also like the ones on http://www.aboutflowersblog.com/5-halloween-floral-party-ideas/! Your ideas are great too! Thanks for sharing! Great information. Anotehr tip for a really spooky and eerie evening is to use dry Ice to create a foggy/ misty feel. Jsut add dry ice to some water. I’m digging out all my Halloween decor this weekend, and I’m so glad you made the suggestion about the dry ice! It’s such an easy trick, and it adds such a fun, macabre touch! Thanks for mentioning it!